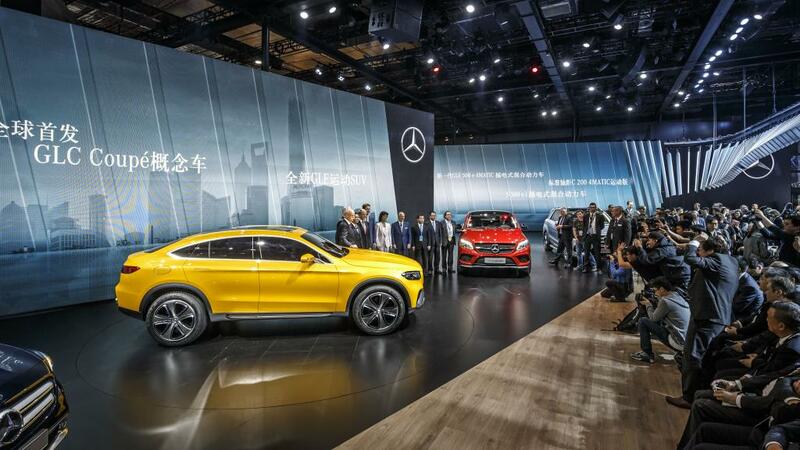 Shanghai Auto Show is hosting the world premiere of the hotly anticipated Mercedes-Benz Concept GLC Coupe, alongside the Chinese debut of its bigger brothers, the GLE and GLE Coupe. Just as we revealed last week, this is clearly the year of the SUV. The Mercedes-Benz Concept GLC Coupe show car combines coupé styling elements with the sensual purity of the design language applied to forthcoming generations of Mercedes-Benz SUVs. 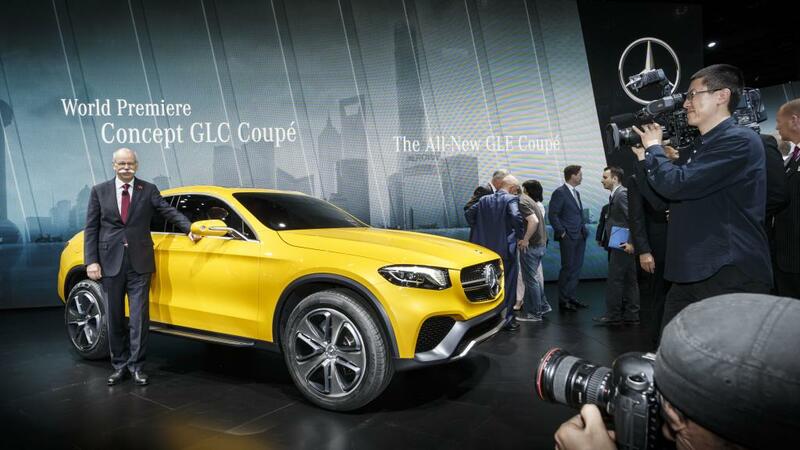 Even though it still bears the “concept” moniker, the GLC Coupe shown at Shanghai is quoted to be “near production standard”, with the “near” part attributed, mostly, to the four-pipe exhaust system and, probably, to the impressive 21 inch wheels. The similarities between the GLC Coupe and the GLE Coupe are obvious, but the GLC Coupe’s dimensions are a bit more compact: with 4.73 meters in length and a 2.83 meters wheelbase, the smaller Coupe SUV is indeed more compact, but will offer plenty of interior space as well. References from the off-road world such as the 21-inch tyres, the underguards front and rear, the increased ground clearance and the running boards along the side emphasise the performance potential of the GLC Coupé concept. Power comes from a V6 biturbo with 270 kW (367 hp) and 520 Nm. Familiar from the AMG Sport models the new engine is matted to Mercedes’ brand-new 9G-TRONIC 9-speed automatic gearbox and 4MATIC permanent all-wheel drive. Mercedes-Benz SUV family goes full-steam ahead in China with the new GLE and GLE Coupe full-size models. 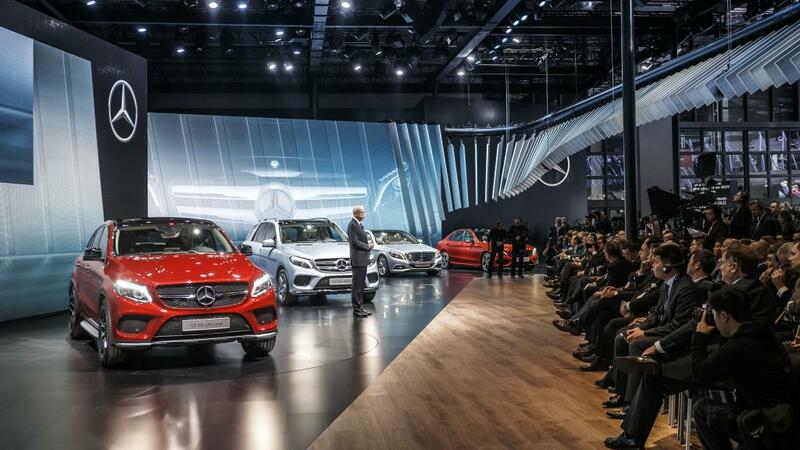 Celebrating their local premiere in Shanghai, the GLE gets fresh looks and a wide-ranging package of measures that deliver best-in-class figures for emissions and drive. One example is the new GLE 500 e 4MATIC, the first Mercedes SUV with plug-in hybrid technology. The high system output of 325 kW (442 hp) contrasts with low CO2 emissions of 78 g/km, equating to an average fuel consumption of 3.3 l/100 km (NEDC). Among the innovations, we noticed the DYNAMIC SELECT handling system, the Sports Direct-Steer system and the brand’s familiar driver assistance systems, as well as the 9G-TRONIC 9-speed automatic transmission and 4MATIC permanent all-wheel drive.